Toni Julian in her lobby displays some of her products. 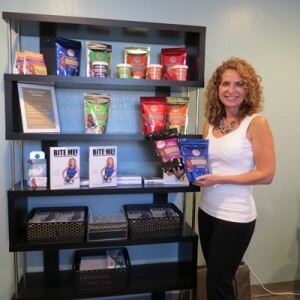 Toni Julian is a local healthy diet advocate and fitness entrepreneur who raves about Morgan Hill as a place to build her business. As the founder of Toni’s Kitchen which operates in an industrial section of town, and the author of a book on healthy eating titled “Bite Me: Change Your Life One Bite at a Time,” Julian is growing a business focused on helping people make wise food choices. Toni’s Kitchen was set up here in Morgan Hill to be a commercial bakery sells products wholesale. The TONI’S HPMs is a line of several oatmeal flavors that serve as a high protein meal solution. Julian came up with the business concept seven years ago when she survived a serious illness and a good friend of hers in Morgan Hill died of pancreatic cancer. It took her four years to formulate her complete meal oatmeal product which is a blend of 22 grams of whey protein, complex carbs and healthy fats that can be prepared in a couple of minutes by adding hot water to the mixture. The mother of four children has several business ventures that focus on her core mission of helping other people achieve healthy lives. Besides her book, she also promotes her blog which gives readers free information on making changes in their dietary habits, and includes recipes such as health-centered smoothies to help people detoxify their bodies. Her Life Changer seminars brings her into corporations where she helps employees (as well as the general public) make sustainable changes in their diet and fitness habits. She also operates a low-impact personal training business in San Jose focused on helping middle aged and older women ease into life changes. “Essentially, I’ve designed these different pieces to help give people the tools that they need, so it’s very comprehensive,” she said. Morgan Hill as a community has played an important part of her life because she went to junior high and high school here, and also has family here. She stays very connected with many of the people she went to school with here. She enjoys her reverse commute from San Jose to Morgan Hill every morning where she doesn’t have to deal with the headache of traffic. Julian was also impressed with working with city of Morgan Hill staff, especially Economic Development Director Edith Ramirez and Ken Deluna. Food-manufacturing companies and restaurants have a lot of restrictions, and the city staff helped her get through the process of getting her business established..
You are the coolest chic I know! Go Giants…. The fireworks are crazy at my house. Love it!